Ok, I must admit that I am so glad that Thanksgiving is over. The entire family was here for the holidays and I'm glad to get my house back in order. I enjoyed having everyone here as it was somewhat of a distraction but also made me miss Cindy that much more. I guess the one thing that I can say is that I'm thankful for my family and friends who have really been a godsend. Anyways, here is a new card that I made with the adorable Snewwy. I think this has got to be my absolute favorite stamp. 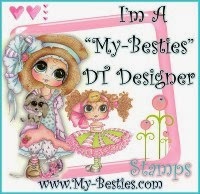 Ok, well next to the adorable Angel stamp that Lisa A generously sent to me. I plan on making cards with that one for the people that were closest to Cindy. Haven't come up with the card idea yet. This is beautiful! I'm glad your holidays were enjoyable. I love how snowy even has glitter on her eyes! Just gorgeous! Precious card. Love your "icicles" and sparkly snow. Beautiful card, Julie! I love the goo punch used like this. It looks like melting ice! Very creative! And this snowman is soooo precious! I love it!! Hey Julie - I too love the goo punch and I think your card is absolutely adorable. This is a wonderful world Julie - I am a newbie with a brand new blog. I am so glad you have family who love you and you certainly have this wonderful Magnolia-licious group to be with you every step of the way. My heart is with you Julie and you make great cards! Julie, this is so cute!!! I love the way you've done the snow on the trees and especially the MS drippy border punch! I want that punch so bad!! I am glad to hear you are creating again and such an adorable card you have made. I love this stamp and you have brought him to life, love his cheeks. Perfect icicles, looks like he might soon be melting...lol. Hugs and special thoughts for you.